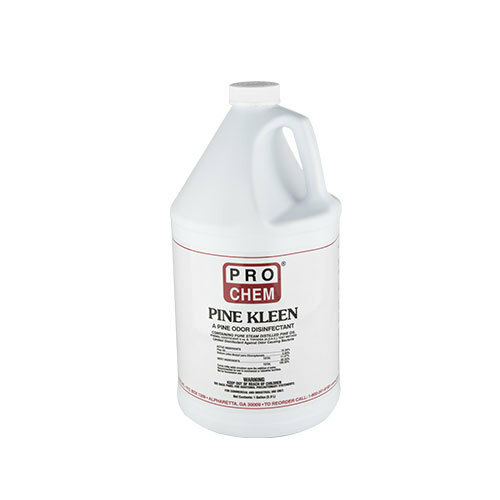 Pine Kleen | Pro Chem, Inc.
PINE KLEEN is a pine-scented disinfectant containing a very potent, broad-spectrum germicide, sodium ortho-benzyl-parachlorophenate, which boosts the power of nature’s own disinfectant, pine oil. This clear, amber concentrate quickly forms a stable, milky white emulsion when added to water. PINE KLEEN is a superior replacement to expensive 80% Pine Oil, because of its broad, germ-killing powers. PINE KLEEN supplies a refreshingly clean, pine odor to effectively combat malodors at their source. Normal dilution is 1.5 oz. per gallon of water. For disinfecting of restrooms dilute 1 to 100 with water. For cleaning, dilute 1 to 10 with water. 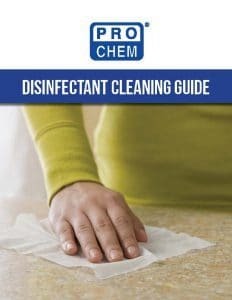 Pour 1 part disinfectant into a pail. Add 100 parts of water (4 ounces disinfectant to 12 quarts water). Stir the milky solution before using. Apply solution with a sponge cloth or by mopping. Wet all surfaces thoroughly and allow to stand for 10 minutes, then rinse. Prepare fresh solution after each use. No rinsing required except on rubber or asphalt tile. Rinse for best shine on no-wax floors.